As ornamental grasses become garden staples, they are finding their way into more and more containers. Growing ornamental grasses in containers is a great way to feature grasses without the worry of them spreading or taking over the garden. Container-grown ornamental grasses are also much easier to divide. The downside is that when you grow grasses in containers, they are less hardy, by about two zones. An ornamental grass that would be hardy to U.S. Department of Agriculture hardiness zone 5 when planted in the ground, will probably only survive to zone 7 in a pot. The actual hardiness of ornamental grasses grown in containers depends upon their exposure, the material of the container, the very variable weather fluctuations of the winter months, and how well you winterize them. 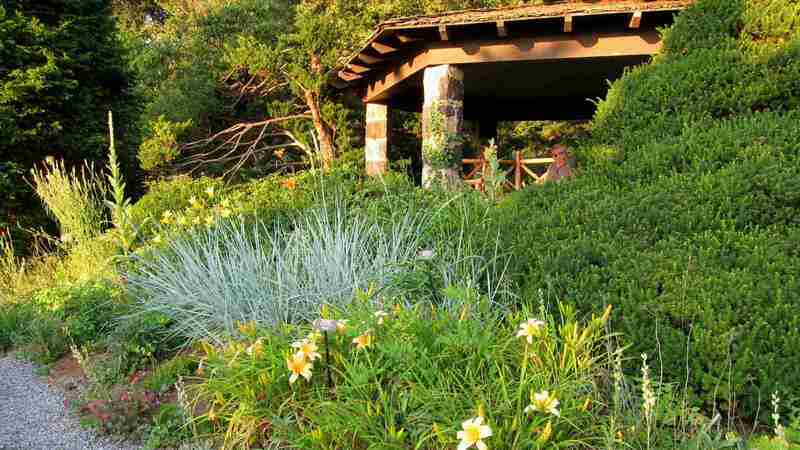 However, you can always treat ornamental grasses in containers as annuals. Caring for ornamental grasses in containers is basically the same as any other outdoor potted plant. They will need regular water, but most are not as thirsty as flowering plants. Your grasses will also need feeding with a high nitrogen fertilizer a couple of times during the summer, and you will need to cut your grasses back each spring or fall. Other than that, the major maintenance will be dividing them. Grasses will quickly outgrow their containers and may crack through them, if not removed, divided and repotted. It's a lot easier to slip a grass out of a container than it is to dig it up. Special note for the USDA zones listed below, it refers to ground-grown plants, not container-grown. Leymus can spread too quickly in a garden bed. Planted in a container you still get the imposing sword-shaped leaves that bend as they grow tall and the spiky flower heads. It grows in USDA hardiness zones 4 through 9. Containers of Helichtrichon bring a cooling blue-gray to the garden as well as a gentle rustling sound and a texture that makes you want to reach out and touch it. It grows in USDA hardiness zones 4 through 9. Fountain grass is a natural for containers, filling the pot with its arching habit. The rich, burgundy color of "Rubrum" has made it a favorite even where it is an annual. It grows in USDA hardiness zones 9 through 10. Others to try include Pennisetum "Burgundy Giant" and Pennisetum orientale. Oriental fountain grass grows in zones 7 through 9. It seems everyone wants Hakone grass once they see it. If you do not have the moist, partially shaded conditions it thrives in, try growing it in a pot. It grows in USDA hardiness zones 5 through 9. This southwest native got the name "Bamboo Muhly" because of its notched stems and feathery, bamboo-like foliage. It thrives in sun and heat and can take a bit of neglect in a container. It grows in USDA hardiness zones 8 through 11. The feather reed grasses are among the most adaptable and popular ornamental grasses for gardens. "Karl Foerster" has wonderful, tall flower plumes that create an eye-catching focal point when grown in a container. Although feather reed grass needs a bit of protection from the hot sun, it can survive winters in containers down to zone 6. It grows in USDA hardiness zones 5 through 9. Sedges are not really grasses but this one is included here because they do not get the notice they deserve. Sedge plants can get lost in a crowded garden, but grown in containers, their bronze tinged leaves gleam in the sun while the narrow blades pick up the slightest breeze. It grows in USDA hardiness zones 6 through 9. 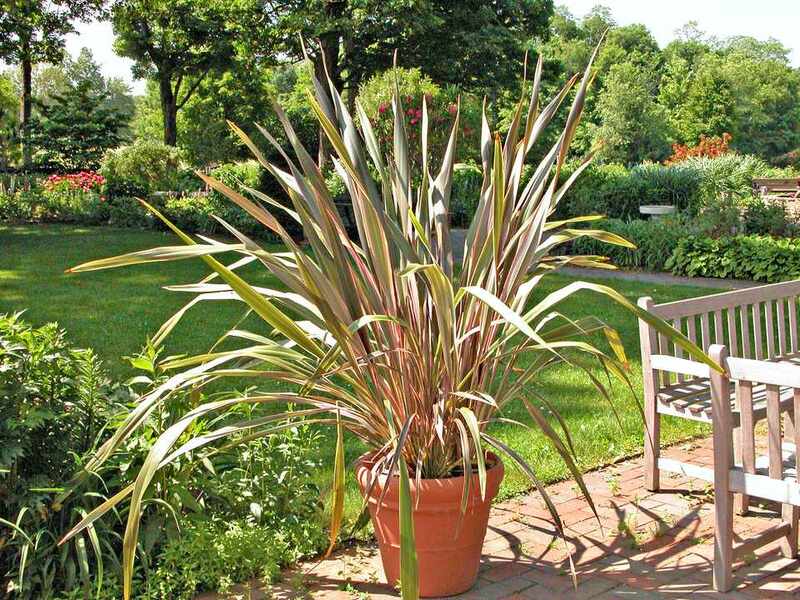 One of the most popularly grown grasses, Miscanthus sinensis, does just as well in containers. The airy growth habit has a softening effect and the white on the leaf margins brightens. It grows in USDA hardiness zones 4 through 9. Other good choices include: Miscanthus sinensis "Variegatus," Miscanthus sinensis "Autumn Morning" and Miscanthus sinensis condensatus "Cosmopolitan." Sometimes a container calls for something short. At a foot or less, Sweet Flag adds a beautiful gold color and the familiar sweet scent that gives it its common name. Sweet Flag needs regular water and some shade when grown in a container. It grows in USDA hardiness zones 10 and 11. Phormiums are frequently used and seldom recognized. Although they are not true grasses, their leaves can be very grass-like and they are used in similar circumstances. For spiky, sword-like form and a variety of colors, including greens, reds, copper, and yellow, they are perhaps the most versatile container grass-like plant to design with. It grows in USDA hardiness zones 9 and 10.